HER PERFECT LIFEIS A PERFECT LIE. I am taking the risk of having books thrown at my by posting this review. Why? Because this was one of the most read, most talked about book of 2015. It has also been dubbed 'The best book' of 2015. However, I could barely get through it. 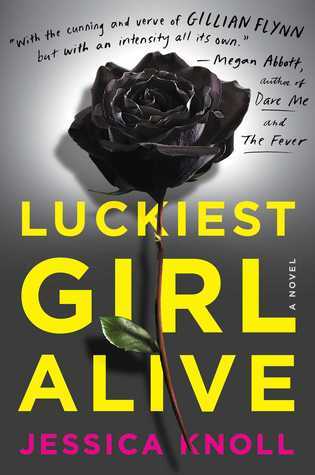 Luckiest Girl Alive seemed like the only novel I was hearing about. I did like Gone Girl, so when it was being advertised to fans as the next Gone Girl, my interest was immediately piqued. I was craving another thrilling, dark page-turner. I eagerly started Luckiest Girl Alive but sadly, that eagerness fizzled. It took everything in me to just 50 pages through. Here are a few reasons why I was not the biggest fan of this novel. This book was praised for it's writing style so I definitely feel like I am missing something! I felt there were scenes that just went on and on. There were conversations between characters that just felt like rambling. The back and forth from past to present was starting to get confusing. I had to keep retracing to figure out where I was in the story. However, despite these reasons, I did finish the book. It never got to the point where I just felt like I needed to give up. The book had a few redeeming qualities that kept me returning. Perhaps by expectations were set a little too high. I am all about second chances so I will happily give Jessica Knoll another try when/if she releases another novel. But hey, just because I wasn't the biggest fan does not mean you won't enjoy it. Different strokes for different folks, right?! Have you read The Luckiest Girl Alive? Please comment below and let me know how you liked it! Link m88.com mới nhất khi bị chặn. Cập nhật liên tục những link 12bet moi nhat tại Việt Nam. Cách vào m88 mới nhất năm 2015 đảm bảo không chặn. Link fun88 moi nhat vào được 100%, cung cấp thông tin đầy đủ nhất về M88. Cá độ bóng đá và game casino online. Watch information speakers Focal and Klipsch http://audiohanoi.com/loa-focal-b1740797.html | http://audiohanoi.com/loa-klipsch-b1572219.html genuine. Thanks!!! Thank you for the review. Because of the name, I think it's a good choice to start a new year. Lựa chọn hành trình, giá vé máy bay và mua vé bay cùng vé máy bay vietnam airlines ngay. Săn vé giá rẻ thỏa sức bay đi khắp nơi & tận hưởng những chuyến du lịch thật thú vị. Sin embargo, a pesar replicas de relojes de (o tal vez como resultado de?) El diseño altamente simplista, me veo atraído por el dial opalino, con el contraste de oro replicas de cartier rosa de números y manos árabes. Beyond the Blog: A New Feature!